What a perfect party favor! 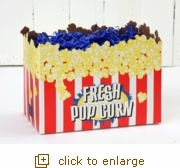 This 10 pack of popcorn themed boxes are originally designed with a die cut popcorn edge. Purchase 10 or more 10 packs and take advantage of the $1.00 per box price!